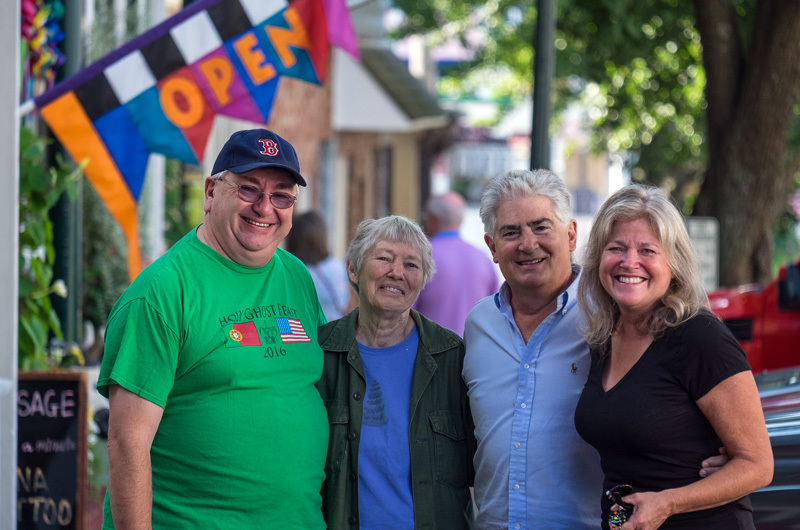 Tivoli Day organizers Keith Enos, Renee Balter, Dennis daRosa, and Christine Todd. It began as a bicycle race, not so unlikely an event as you might think, as it turns out. 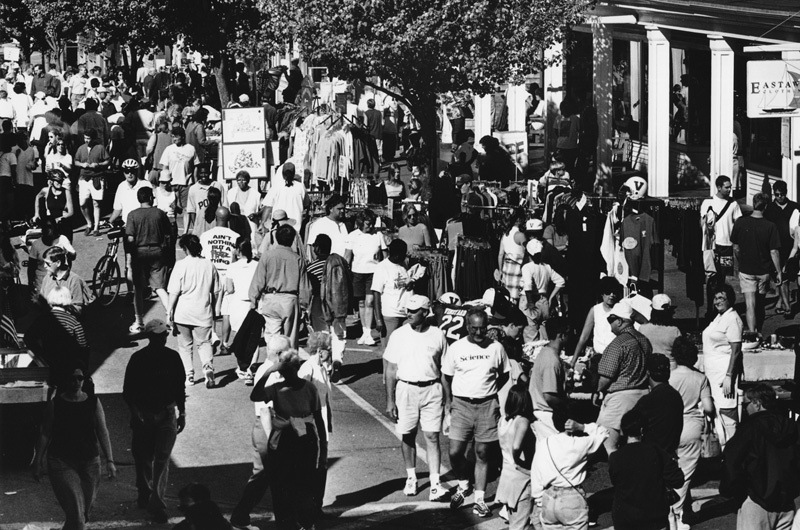 Forty years later Tivoli Day is the end-of-summer celebration of Oak Bluffs. There are no bike races any more, but there is just about everything else. This year’s 40th anniversary celebration on Saturday, Sept. 16, is dedicated to the late Ed Coogan and Michael Wild. Mr. Coogan, a well-known Island attorney, and Mr. Wild, an equally well-known Island conservationist, are credited with founding Tivoli Day. The name comes from the long gone but not forgotten Tivoli Dance Hall which gained fame in the roaring twenties, and hung on for various other uses until it was demolished in 1964. It sat near the site of today’s police station on the waterfront. “It was our parents’ and grandparents’ Hot Tin Roof of the day,” said Dennis daRosa, a longtime Circuit avenue businessman and one of the organizers of this year’s Tivoli Day. 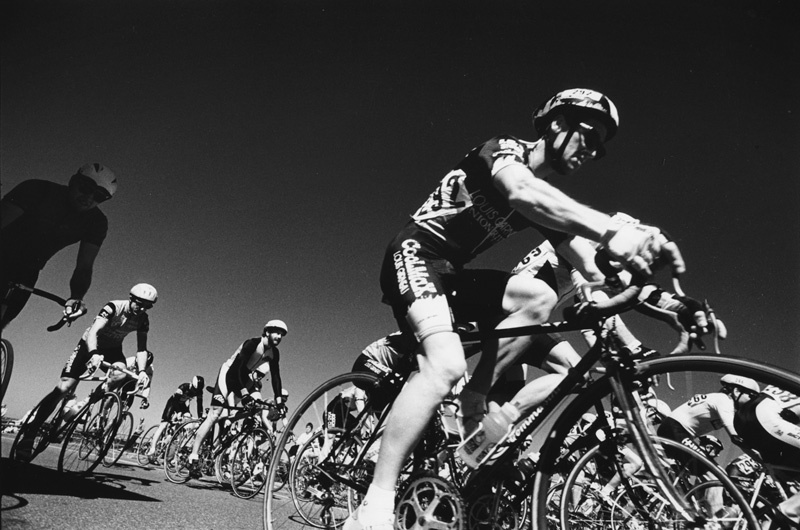 The Cottage City Bicycle race drew the best amateur and professional bike racers from around the world to Martha’s Vineyard in the early days. The race was intended to be a link to the past. In the 1880s and 1890s, the smooth roads of Oak Bluffs proved to be quite a draw for organized bicycle races. In 1978, town officials added a series of events to the fledgling bike race, in hopes of reviving a moribund late season business climate, and Tivoli Day was born. A story in the Sept. 15, 1978 Gazette described the event with great anticipation. Music has always been a big part of Tivoli Day. In the early days of the celebration, Island bands would set up in Healey Square near the Post Office, but the sound reverberated from the buildings so loudly, according to Mr. daRosa, that organizers moved the location to the top of Circuit avenue. This year Johnny Hoy and the Bluefish headline the event beginning at noon. The Phil daRosa Project takes the stage at 2 p.m., followed by a group of songwriters and rising stars from Nashville, Tenn. at 4 p.m. In years past musical acts were organized by the well-loved Island blues musician Maynard Silva. Until his death in 2008, all it took was a phone call to get the planning started. In earlier days, the street fair part of Tivoli Day was a little slow to catch on. Some merchants sold wares in front of the stores, but there were gaps because some stores and businesses had already closed for the year. Organizers began to fill in the gaps with artisans and vendors. Tivoli Day gets underway at 10 a.m., and continues through 6 p.m. Organizers expect up to 5,000 people to take part in the festivities, which will include outside dining, food vendors, music, face painting, end-of-season retail sales, and raffles. In the event of rain, Tivoli Day will be postponed to the following day, Sunday, Sept. 17.